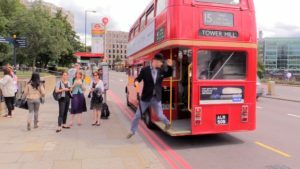 Find out how to travel around London and buy oyster cards with a true Londoner. If you’re visiting London for the first time or you aren’t a regular visitor you might find the system of buying tickets confusing. Watch my video to get some good tips to prevent yourself from paying more than you should on London Tubes, buses and trains. Travelling around London can be paid for by using paper tickets or by contactless payment. Other options are Apple watch and Apple pay. DO NOT BUY A PAPER TICKET if you want to save money. The only time you might want to buy a paper ticket is if you are 16 or 17 years old. 16 and 17 year olds can travel at half price but this can’t be done on an oyster card unless you apply for a “child rate oyster zip card”. Children under 15 travel for free. The only other reason you might use a paper ticket is if you don’t have a contactless credit or Debit card or an oyster card or apple pay AND you are only in London for one day. With an oyster card you can get a refund on your deposit and unused credit if it’s under £10 and you have had it more than two days. If you are not from the UK it’s best to buy an Oyster card. This is a card on which you can place credit for journeys around London using buses, tubes, trains, boats and trams. You can either use Pay As You Go Credit (which means that you just put a certain amount on it and pay for single journeys) or you can put a weekly or monthly travel pass on it. If you don’t make lots of journeys it’s best to use pay as you go credit. Even if you use it 10 times in one day there is a capping system which means you will never pay more than the price of a day travel card. So the machine reads your cards and realises you’ve used it enough times to qualify for a day travel pass and it won’t charge you any more. 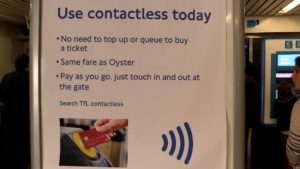 If you have the contactless payment symbol on your credit or debit card you can use it as an oyster card and just touch in and out on the ticket machines. No need to top up the credit. It works exactly the same way as an oyster card. This is the most convenient way to travel if you are from the UK but if you have a foreign card your might not want to keep paying the foreign bank charges! Always remember to touch in and out, even if the barriers are open or there are no ticket gates. If you don’t you will be charged the maximum amount possible. Oyster cards and pay as you go credit can be used on the Emirates Airline cable cars too, as well as the Thames Clipper boat services. However, different fares do apply so always check to make sure you have enough. And for more videos by Joolz please subscribe to our channel and tell your friends! Hey everyone, I’ve got some excellent news! I just joined Patreon! In case you’re wondering, Patreon is a simple way for you to contribute to my channel every month and help support my production costs so that I can keep creating great content for you to enjoy. Checkout my Patreon page!